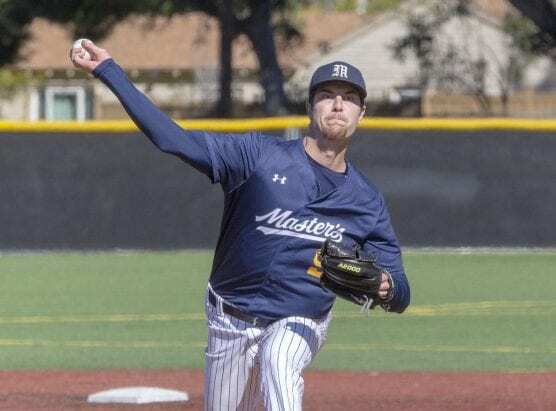 Friday afternoon on a sunny, windy day in Placerita Canyon, the Mustangs rode Robert Winslow‘s strong right arm to an 11-1 victory over Hope International in the second game of a double-header. The Royals won the opener 7-3. Winslow really executed in the nightcap. The big right-hander went the distance for the second outing in a row, scattering four hits and striking out seven to improve to 5-2. He retired the Royals in order in four of the first five innings and allowed their only run in the sixth. By that time, his teammates had given him nine runs to work with. Junior designated hitter Roy Verdejo, who went 2-for-3, drove in the game’s first run in the last of the first, plating Nick Tuttle with a single to right field. The club ramped up its production over the final four frames, scoring three times in the third, adding four more in the fourth, tacking on another in the fifth, and closing it out with two more in the sixth. In the third, Anthony Lepre and Kameron Quitno sandwiched run-scoring singles around a Verdejo RBI double for a 4-0 lead. An inning later, the club used four hits and a Royal error to double its advantage. With one out, Shackelford swatted his NAIA-leading 14th homer of the year, a solo shot over the right-field fence. Later in the frame, Max Maitland‘s single drove in Lepre; Ryan Bricker plated Verdejo with a base hit; and Byron Smith capped the scoring with a sacrifice fly that brought home Quitno. Lepre, who was 2-for-4, slugged his 12th home run of the season in the fifth, a solo, two-out blast over the right-field fence. After the Royals nicked Winslow for their only run in the sixth, the Mustangs answered with their final two runs in the last half of the inning on a Colton McCaughtry RBI double and a Jeremiah Farris RBI single. The team’s 2-5 hitters (Shackelford, Lepre, Verdejo, and Quitno) went a combined 8-for-15 to lead the club’s 15-hit attack. They could have used many of those hits in the opener. However, Royal starter Henry Martinez didn’t cooperate. Martinez stymied the Mustangs, allowing just three hits through eight innings of work. The Mustangs finished with five hits. The only run Martinez gave up was a Maitland RBI single in the last of the second. He went 2-for-4.